A council is investigating claims that dog walkers are failing to clean up after their pets on part of a new footpath and cycle route in Ceredigion. The 20-mile (32.1km) £1.7m Ystwyth Trail linking Aberystwyth and Tregaron opened to the public in September. But there are complaints that a section between Aberystwyth and the village of Llanfarian is littered with dog mess. Ceredigion council is to investigate the extent of the dog-fouling problem before taking action. The start of the path in Aberystwyth is in county councillor Aled Davies' ward, and he has received a few complaints from walkers and cyclists. "Dog owners are using the path to walk their dogs and they are not clearing up after their pets and it's bothering people," he said. "It's not too bad along sections in more rural areas, but when the path enters more urban areas the mess is more noticeable. "One suggestion could be that town and community councils erect disposal bins and signs warning dog owners." A spokesman for Ceredigion council said public foot and cycle paths should not be used as "dog toilets". He added: "Dog owners must take responsibility for the behaviour and actions of their pets. 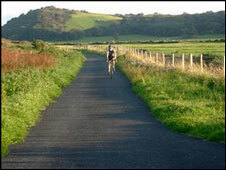 "Many people take advantage of cycle paths, including families and children. It is not unreasonable to expect dog owners to pick up any mess their dogs deposit and to dispose of it appropriately. "The majority of pet owners in Ceredigion towns and villages are able to do this and there appears no obvious reason why individuals exercising their pets along the Ystwyth Trail should not do the same."